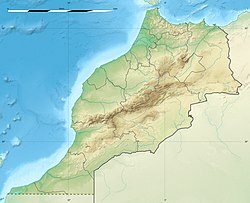 The Kem Kem Beds (also referred to by various names including the Continental Red Beds and Continental intercalaire) is a geological formation along the border between Morocco and Algeria in southeastern Morocco, whose strata date back to the Late Cretaceous. Dinosaur remains are among the fossils that have been recovered from the formation. Recent fossil evidence in the form of isolated large abelisaurid bones and comparisons with other similarly aged deposits elsewhere in Africa indicates that the fauna of the Kem Kem Beds (specifically in regard to the numerous predatory theropod dinosaurs) may have been mixed together due to the harsh and changing geology of the region when in reality they would likely have preferred separate habitats and likely would be separated by millions of years. "Partial braincase of a large individual with skull roof, temporal, and occipital regions." Known from an isolated caudal vertebra. Initially thought to be a neotheropod, but subsequently discovered to be an indeterminate crocodyliform. Indeterminate lithostrotian remains once misattributed to the Titanosauridae are present in the province of Ksar-es-Souk, Morocco. "Partial skeleton, isolated limb elements." A noasaurid ceratosaurian or possible neovenatorid carnosaur. May be synonymous with Bahariasaurus. 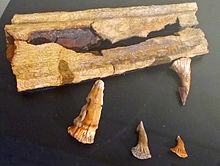 Fossils previously referred to cf. Elaphrosaurus are actually indeterminate theropod remains. Fossils assigned to Brachiosaurus are actually from an indeterminate titanosauriform, still assigned to "B. nougaredi". "An isolated and almost complete left frontal." A carcharodontosaurid distinct from Carcharodontosaurus. Averianov (2014) considered these vertebrae to pertain to Alanqa saharica, although the vertebrae may be indicative of two taxa. Averianov (2014) considered it to be a specimen of Alanqa saharica. Dsungaripteroidea (sensu Kellner, 2003) indet. Anterior fragment from a jaw, possibly a mandible. May be a specimen of Alanqa saharica or a non-azhdarchid azhdarchoid or nyctosaurid. A fragment of bone, possibly the anterior section of rostrum. A possible pteranodontid or a specimen of Alanqa saharica. Classified by some authors as a species belonging to the genus Coloborhynchus. A fragment of bone originally interpreted as a fragment of anterior mandibular symphysis, though it might pertain to the rostrum instead. Might belong to the family Thalassodromidae or be a specimen of Alanqa saharica instead. ^ a b c d e f g h i Weishampel, David B; et al. (2004). "Dinosaur distribution (Late Cretaceous, Africa)." In: Weishampel, David B.; Dodson, Peter; and Osmólska, Halszka (eds. ): The Dinosauria, 2nd, Berkeley: University of California Press. Pp. 604-605. ISBN 0-520-24209-2. ^ a b c d Cavin, Lionel; Boudad, Larbi; Tong, Haiyan; Läng, Emilie; Tabouelle, Jérôme; Vullo, Romain (2015). "Taxonomic Composition and Trophic Structure of the Continental Bony Fish Assemblage from the Early Late Cretaceous of Southeastern Morocco". PLOS ONE. 10 (5): e0125786. doi:10.1371/journal.pone.0125786. ISSN 1932-6203. PMC 4446216. PMID 26018561. ^ "Onchopristis - Paleobiology Database - Details - Encyclopedia of Life". Encyclopedia of Life. Retrieved 2018-07-07. ^ Casey M. Holliday; Nicholas M. Gardner (2012). "A New Eusuchian Crocodyliform with Novel Cranial Integument and Its Significance for the Origin and Evolution of Crocodylia". PLoS ONE. 7 (1): e30471. Bibcode:2012PLoSO...7E0471H. doi:10.1371/journal.pone.0030471. PMC 3269432. PMID 22303441. ^ a b c Cau, Andrea; Maganuco, Simone (2009). "A new theropod dinosaur, represented by a single unusual caudal vertebra from the Kem Kem Beds (Cretaceous) of Morocco". Atti Soc. it. Sci. nat. Museo civ. Stor. nat. Milano 150 (II): 239–257. ^ Lio, G., Agnolin, F., Cau, A. and Maganuco, S. (2012). "Crocodyliform affinities for Kemkemia auditorei Cau and Maganuco, 2009, from the Late Cretaceous of Morocco." Atti della Società Italiana di Scienze Naturali e del Museo di Storia Naturale di Milano, 153 (I), s. 119–126. ^ a b c d Ute Richter; Alexander Mudroch; Lisa G. Buckley (2013). "Isolated theropod teeth from the Kem Kem Beds (Early Cenomanian) near Taouz, Morocco". Paläontologische Zeitschrift. 87 (2): 291–309. doi:10.1007/s12542-012-0153-1. ^ Alfio Alessandro Chiarenza; Andrea Cau (2016). "A large abelisaurid (Dinosauria, Theropoda) from Morocco and comments on the Cenomanian theropods from North Africa". PeerJ. 4: e1754. doi:10.7717/peerj.1754. PMC 4782726. PMID 26966675. ^ "Table 4.1," in Weishampel, et al. (2004). Page 76. ^ "Table 4.1," in Weishampel, et al. (2004). Page 78. ^ Upchurch, P., Barrett, P.M. & Dodson, P. (2004). "Sauropoda", pp. 259–322 in Weishampel, D.B., Dodson, P. & Osmólska, H. (Eds.) The Dinosauria, 2nd edition. University of California Press, Berkeley and Los Angeles. ISBN 0520254082. ^ a b B. McFeeters (2013). "Bone "taxon" B: Reevaluation of a supposed small theropod dinosaur from the mid-Cretaceous of Morocco". Kirtlandia. 58: 38–41. ^ a b Andrea Cau; Fabio M. Dalla Vecchia; Matteo Fabbri (2012). "A thick-skulled theropod (Dinosauria, Saurischia) from the Upper Cretaceous of Morocco with implications for carcharodontosaurid cranial evolution". Cretaceous Research. in press: 251–260. doi:10.1016/j.cretres.2012.09.002. ^ a b Andrea Cau; Fabio Marco Dalla Vecchia; Matteo Fabbri (2012). "Evidence of a new carcharodontosaurid from the Upper Cretaceous of Morocco". Acta Palaeontologica Polonica. 57 (3): 661–665. doi:10.4202/app.2011.0043. Archived from the original on 2012-11-08. ^ a b c d e f g h i j Ibrahim, N.; Unwin, D.M. ; Martill, D.M. ; Baidder, L.; Zouhri, S. (2010). "A New Pterosaur (Pterodactyloidea: Azhdarchidae) from the Upper Cretaceous of Morocco". PLoS ONE. 5 (5): e10875. Bibcode:2010PLoSO...510875I. doi:10.1371/journal.pone.0010875. PMC 2877115. PMID 20520782. ^ a b c d e f g h i j k Taissa Rodrigues; Alexander W. A. Kellner; Bryn J. Mader; Dale A. Russell (2011). 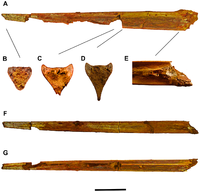 "New pterosaur specimens from the Kem Kem beds (Upper Cretaceous, Cenomanian) of Morocco". Rivista Italiana di Paleontologia e Stratigrafia. 117 (1): 149–160. ^ a b c d e Alexander Averianov (2014). "Review of taxonomy, geographic distribution, and paleoenvironments of Azhdarchidae (Pterosauria)". ZooKeys. 432: 1–107. doi:10.3897/zookeys.432.7913. PMC 4141157. PMID 25152671. ^ a b Jacobs, Megan L.; Martill, David M.; Ibrahim, Nizar; Longrich, Nick (March 2019). "A new species of Coloborhynchus (Pterosauria, Ornithocheiridae) from the mid-Cretaceous of North Africa". Cretaceous Research. 95: 77–88. doi:10.1016/j.cretres.2018.10.018. ISSN 0195-6671. ^ a b Rodrigues, Taissa; Kellner, Alexander W. A (2008). "Review of the pterodactyloid pterosaur Coloborhynchus" (PDF). Zitteliana. B 28: 219–228. ^ a b c Peter Wellnhofer; Eric Buffetaut (1999). "Pterosaur remains from the Cretaceous of Morocco". Paläontologische Zeitschrift. 73 (1–2): 133–142. doi:10.1007/BF02987987. This page was last edited on 14 March 2019, at 00:05 (UTC).